I love vending machines so I had to check out the new Walgreen’s flagship that had not just sushi, a manicure bar, and the most wine I’ve ever seen outside a liquor store, but also several information kiosk-y type things. 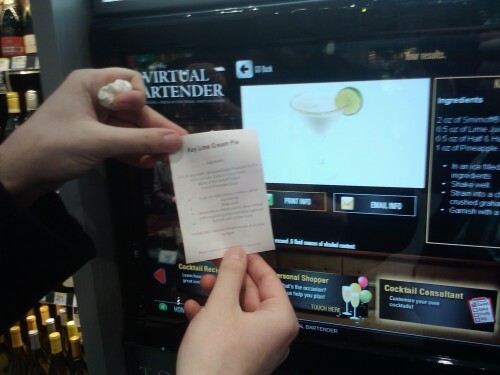 My favorite was the virtual bartender – put in your base liquor, a few flavor preferences, and get a list of cocktails. For your convenience, you can either email or print out the recipe, complete with shopping list (we went with the key lime creme pie martini). This entry was posted in Places, Vending Machine. Bookmark the permalink.